After working around the clock to relaunch Vivid Talk™ Radio and developing every imaginable asset to effectively plan and publish the content necessary to also launch Vivid Magazine and Vivid Talk™ LIVE, I have to ask myself, “Why is it that the most important things for us to do are the hardest to complete?” Of all the hats that entrepreneurs wear, the hardest may just be writer–even for writers. It’s true for me, and it’s worse for my clients. I’ve been actively seeking tools to help me help myself and my clients for five years. I’m kind of embarrassed to discover that I was first introduced to Coschedule almost a year ago (yikes), and it was a first meeting that made my heart sing. As an agency owner, I have a list of marketing projects and social media accounts that is daunting to say the least. I am the first to recommend that one of my enterprising friends writes a blog. Advice abounds as my inner Coach rises up to save the day, yet getting beyond the stops and starts of my own blogging cycle has been nearly impossible. The search for a content calendar has been a 5-year journey that always led me back to Google Calendar. At least I could get a digital overview of what was in my head, schedule content ideas, keep a list of tasks, and share them with others. Google apps made it possible to edit from multiple devices. Perfect. Right? Not if you add all of the other programs, apps, and services I needed to keep the whole thing running. In comes Coschedule to save the day! Only I had to lift my head up from the work. As the Process Queen, it has taken all of those twelve months to expand my circle to get to know all that Coschedule has to offer. I would love to give you a thorough, step-by-step overview or tutorial…and even a testimonial of my success using Coschedule. However, this post is mostly about what Coschedule has forced me to come to terms with. That nagging inner voice, “Gwen, you are having trouble publishing consistent content because you don’t have a plan or a process.” But, I have a process for everything! And planning is practically my middle name. When I looked around at my friends and my clients, I realized that we all have the same problem. Since I am surrounded by what I suspect is a disproportionate number of doers than the average person, they have formed a bit of a “focus group” for me (only because it’s so much easier to analyze others, than yourself). I don’t see anyone publishing consistent content. They seem to fall into two categories: 1) those that publish randomly, and 2) those who “hire” someone to do it. Now, if the stone I just threw made you holler, “Ouch,” hang in there with me. Let’s talk about “hiring” someone. You can’t farm out your content entirely any more than you can pay someone to raise your children. Sure. You can employ someone else to help you with the mechanics of raising a child–picking them up, dropping them off, making them meals, etc. But they are no replacement for you–your heart, your soul, your values. You’re the only one who can impart that. So it is with your content. You can find apps to help you make graphics, post automatically, and even give you analytics, but you have to do the inner, strategic work first that gives them something to build on. Otherwise, they might get you to the front page of Google, but when visitors click, they are introduced to someone you don’t even recognize. Finding your voice. Sharing your unique message. Offering value. That’s publishing content–not just for publishing’s sake, but for long-term growth, development, and relationship building with your customers, clients, and audience. And what Coschedule has done for a YEAR in my inbox is coach me…not just on how to use their product, but how to get a plan and create a process. I know who I am and what I have to offer, but sharing all of that requires a foundation, a platform. Coschedule has slowly pushed its way through the crowd of tools, and I’m ready to finally master it…and myself. Coschedule’s Calendar gives you a color-coded, topline view of all of your marketing projects and who’s working on them. Nathan, Kat, Garrett, Julie, Ben–they’ve all been coaching me through their emails and demonstrating why offering consistent value matters. And even why doing it when it doesn’t feel like anyone’s listening matters even more. I’m the perfect example. When I began writing this post, I thought I’d been introduced to Coschedule nine months ago, only to discover that it’s been almost twelve–requiring a very quick edit. (Surely, I’ve destroyed any sales funnel they could have created.) If every lead took this long to make a decision, most companies would be out of business. Yet, what they have done is demonstrate the power of publishing consistent, relevant, useful content. As much as I suspect I’ll love Coschedule as a tool, what I appreciate even more is the instruction, the lessons, the training. When I search my email for “coschedule”, the subject lines read like a master course in content publishing. I am literally going through them one at a time, searching for nuggets as I am getting started with Coschedule. Here’s my top-line list of what really did it for me. 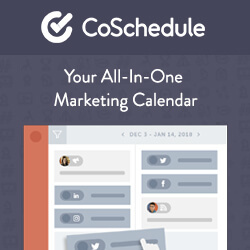 Coschedule gives me the opportunity to start and manage all of my marketing projects in one place–from concept to completion. I am currently managing a dozen in-house and client brands and over 50 social accounts–posting primarily around events or account startup. Getting blog content from a client can be like pulling teeth (with the patient’s mouth closed). My graphic design roots make me cringe every time I release the responsibility for managing social media to anyone else. I always regret it. So, the ability to upload images, videos, text, post concepts, project tasks, and the like to Coschedule for collaboration with the entire team is almost too good to be true. In addition to overload and the need to change my way of thinking about content, price was a factor in my procrastination. At first glance, Coschedule is more expensive than all but one of the other tools I have used. However, writing this review and referring others will reduce the cost. In fact, I have marked this as a “Sponsored Post”, not because Coschedule is paying me directly, but because I will be actively involved in helping you and others purchase and master their service. It’s what I do. All my friends know that when I find a tool that works, EVERYONE will know about it. I’ll keep you posted on what I learn.